Welcome to another Cardboard Commentary article! I hope you enjoyed the past four postings focused on collecting the different sports. A big 'thank-you' goes out to those of you who took the time to read them! And special appreciation goes out to those of you who commented with your opinion. I appreciate the feedback! If you haven't read them yet, or want to comment on them, feel free to click on the following links before reading this one! Here they are: baseball, basketball, football, hockey. 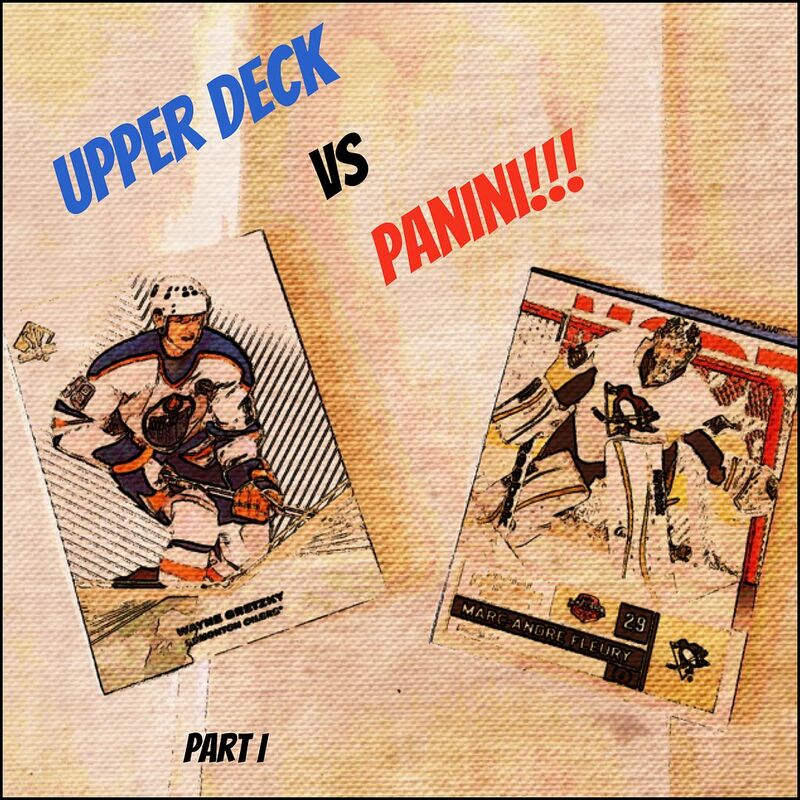 Today's article will begin a short series about the two major producers of officially licensed NHL cardboard: Upper Deck and Panini. Is one better than the other? I'll try to highlight some pros and cons of each as well as offer up some suggestions that I think would make them better in the following weeks. I'm sure collectors will have strong opinions about this topic as everyone has their favorites. I'll begin with Upper Deck as they are the perennial card maker of modern NHL cards. Before Panini in the 10/11 season, Upper Deck was the only officially licensed maker of NHL cards. For about five years, they had total reign on the hockey card industry. While that may seem like a bad thing in terms of collector choice and variety, they actually did a very good job of offering a huge variety of products for collectors to buy. From low-end cards like Victory, MVP, and O-Pee-Chee, to mid-enders Series 1/2 and Artifacts, to the high-end with Ultimate Collection and The Cup... there was a lot to choose from - and there still is. Upper Deck has done a masterful job of giving collectors a choice of products. And each product in recent memory has been worth buying. So what makes Upper Deck such a strong purchase choice? For me, it has to be in their card design. Upper Deck makes the classiest cards out there. Upper Deck's distinct card stylings have been very difficult for their competitors to match. And when others do something similar to the way UD does it, they get called out for it - I'm looking at you 11/12 Panini Contenders! UD has been leading the way in making amazing looking cards since they debuted with their groundbreaking baseball card set in 1989. The cards hit at collectors' desire for a more mature, adult card. Upper Deck has always given high quality cardboard and careful execution to their targeted audience. From low to high end, the quality has has always been there. Victory, now discontinued, was the lowest of the low in Upper Deck lines. Though it was cheap and didn't contain a chance at an autograph or memorabilia card, the eye popping graphics and glossy feel of the card was a perfect jumping in point for very young collectors. And even for more mature collectors, Upper Deck snuck in the ridiculously difficult to get black parallel cards. For player collectors, these were a nightmare to track down, but were highly sought after. And the black border made the cards look oh-so-sweet. On the mid-end side of things, Upper Deck Series 1 and 2 as well as the SP Authentic and Artifacts lines gave collectors amazing looking cards at inclusive prices. I've heard very little said about how ugly Upper Deck Series 1/2 cards are. Do people even dislike the way those look... ever?!?!? UD does such a good job with the design and photography that just about all collectors go for that set each and every year. It's just that good. And the same can be said of SPA. While there are a few who think SPA cards are too spartan and too simple, there are many more who enjoy the modestly designed SPA cards - particularly the Future Watch rookie cards. Upper Deck just knows how to hit the sweet spot in card design. And in talking about Upper Deck high-end... the accolades just keep on coming from a design perspective. Ultimate Collection and The Cup (and OPC Premier before it was discontinued) satiated collectors' desire for the highest of the high end. The use of foil, thick card stock, and modern design made collectors suddenly poor in their chase for these cards. I, myself, can't help but drool at some of these high-end cards. It's apparent that Upper Deck knows how to make great looking cards. But not only are the cards great to look at, they are consistently hold the highest value of all other manufacturers. When you look at the value of Upper Deck cards in comparison to similar Panini cards, Upper Deck cards will almost always be higher - even if the print-run differs in the other's favor. Check out a Ryan Nugent-Hopkins Contenders on-card rookie and a Future Watch Nugent-Hopkins. The Contenders is serial numbered to 800 while the FWA is to 999. The FWA beats the Contenders in sale value. It doesn't make sense from a pure analytical numbers comparison, but in the actual market place, it is obvious that Upper Deck cards are the more sought after ones. The same thing happens with Ultimate vs. Prime/Limited (though this isn't really fair as some Ultimate RCs are /99), Pinnacle vs. UD1/2, and Dominion v. The Cup. Like I said, Upper Deck almost always comes up on top. It can be said that Upper Deck has an edge in value because of it's time as the only card manufacturer let it establish some core brands, but nonetheless, it doesn't diminish the fact that UD reigns supreme in terms of which cards are the most sought after - just follow the dollar signs. It's also worth mentioning that Upper Deck is the only company to be able to make cards of Wayne Gretzky and Bobby Orr. With those two exclusives in the line-up... UD has an even bigger edge versus its competitors. As for negatives concerning Upper Deck, I have heard numerous complaints about UD's customer service. Collectors on forums complain about their replacement policies quite a bit. I, for one, have never had an issue with UD customer service. But, that's not to say I won't in the future. In the customer service department, Panini seems to have the edge in that it is more transparent than UD. Upper Deck occasionally will let collector's know what is going on within the company, with the status of products, checklists, and redemption updates... but this area could use some significant improvements if it wants to catch up with Panini. Upper Deck also seems to be slowing a little in terms of card innovation. Recently Panini has really stepped up its game in terms of their card products. Though Panini may have lagged behind to start, it seems as if their growth and improvement rate is better than UD's. Upper Deck has slowly build upon and improved it's core card lines... but nothing has been very groundbreaking as of late. One area I feel that Upper Deck needs to improve upon is with its game-used cards. Upper Deck could do a better job of making sure collectors know where game-used or player worn material comes from. ITG is by far the leader in this area, and Panini at least has technology that prevents game-used material on cards has not been faked. UD occasionally will allow collectors to see where they get their game-worn pieces via Facebook or other media source, but as collectors get more and more demanding of quality, UD will need to step-up more and more to keep up with everyone else. Upper Deck should not let it's high place in the market allow it to stagnate and rest on its laurels. Upper Deck needs to continue to innovate and impress collectors not only with their service, but in their cards. Panini (and ITG, too) is definitely upping the ante and giving Upper Deck some much needed pressure in both those areas. Next time I'll put the focus on Panini and what they're doing with their cards. Let me know what you think of Upper Deck in the comments section. What could they do better? What do you like about them? What don't you like? Feel free to discuss! I'd say I'm a lot kinder to Panini in the design department. It was their products that caught my eye more in the 11/12 season (which I'll probably address in your follow up entry), with much of Upper Deck's products using a drab muted colour scheme and some flat chunky framing. 11/12 Ultimate Collection for me was a disaster in design; very drab, with a dated looking marble/wood panel background and huge blocks dividing the card. Of their midrange gear, Artifacts has stood out the best to me for the last 3 seasons... though I feel like the 12/13 Tundra Tandems were a step back with an incongruous design that split the card in half. Things did pick up though, 11/12 SP Authentic was fantastic with some nice holo foils giving a nod to old 90s inserts, 12/13 Game Used is a big improvement over 11/12 with a less rigid layout that gives the player shot room to breath. I won't dispute that Panini looks to Upper Deck for ideas, especially when you compare 12/13 Limited Jumbos against 12/13 SP Game Used Authentic Fabrics. What can Upper Deck do better? Don't crowd the design with chunky framing, use less brown and be a bit more subtle with your designs. Design the card as whole rather than breaking it up into segments. Also bring back bring back BLACK. The best things Upper Deck has going for them is The Cup and Artifacts. I didn't know until reading your blog that Bobby Orr and Gretzky belong solely to UD products. That's a huge pull for them! When I bought the Cup it was the scariest, heart pounding card purchase I've done. Those cards are the best works of art out there. It's a huge gamble though, which makes it that much more exciting. Everyone loves the variety of short print cards Artifacts has to offer, and not too expensive. The bad about UD is Fleer Retro. I didn't see the purpose of making it so expensive. Do inserts cost a lot to produce? One of the inserts I got was a metal universe Dominic Hasek and I swear, it was the worst manufaturing job since the 11-12 SPX centering being too high. The card had jagged edges and it was bigger than the other inserts. Horrible misprint of that card. I think UD were being cocky and flexing their nuts charging too much for that product b/c they felt like they could, and people would still buy it. Well f-them, they were right probably. The right idea came from them when they dropped the price of 12/13 SP Game Used on first release. They should continues that trend, making these boxes more affordable. When the 12/13 SP authentic comes out, I'm sure it'll be highly saught after. But please don't make it $150/box or some junk. Yea, I'd love to see UD bring Black back! It was such a great high end product that came towards the beginning of the season rather than the end. I definitely miss it as it also came with some of the best looking cards ever made! Panini tried to do a 'Black' type product in football and basketball. Neither of them even came close to how UD did their Black product line. And YUP... UD has the exclusive rights to Gretz and Orr. THAT IS HUGE for them. They also have exclusives for Michael Jordan, LeBron James, and Tiger Woods autos. Having exclusives like that can really drive up the demand for products. I mean, in the Cup you can pull Gretzky autos and patches... and you can pull Gretzky dual autos with other players. Imagine if Dominion had that same ability. I'm sure it would at least close the gap a little between the two brands. I prefer UD the cards look a bit better I prefer the cards you pull, but panini has some great prices it is hard to tell. and with the gretzky/ orr panini has done other things to close the gap, they have lots of other great players that are common to pull (Hull (both, Savard, Etc) I really like the base design of 12-13 SPA, SPGU, and 13-14 trilogy, The base autos from those sets look amazing!